This book is a milestone in Western magical practice. Often erroneously called a forgery, it is in fact six separate books in one, the first two being by Agrippa (1486-1535). One of them, Of Magical Ceremonies, is Agrippa's clearest step-by-step formulation of how to perform an evocation, much more openly expressed than in his Three Books of Occult Philosophy. 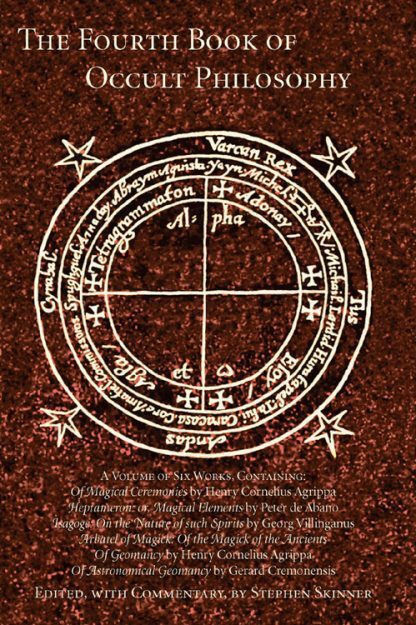 In addition there is the key grimoire, Of the Magick of the Ancients by Arbatel, which clearly defines the different types of magic, focusing on the invocation of angels and of the Olympic spirits. The Heptameron by Peter de Abano is a complete, self-contained set of instructions for conjuration of spirits according to the day of the week. Also included is Villinganus' work on the nature of spirits, illusions, prophecies, and miracles, and how they may be used. Two complete geomancies (one by Agrippa) complete the volume, which has been reset in modern type and edited with a commentary by Stephen Skinner.